Capt. Samuel Hampton was born ca 1758 in that part of Rowan County, NC that became Surry County and then Stokes County. He was one of the executors of his father James Hampton’s will, and was left property by his father (Book 2, page 3 ¾) in Stokes County who “willed to his youngest son Samuel 280 acres on Townfork Creek except ½ acre for cemetery." Samuel served in the Revolutionary War, when he “volunteered in the first troops of militia under Col. Joseph Williams, Major Joseph Winston, and Capt. Richard Goode and served in the Cherokee Expedition. Later he served five months under Gen. Ashe and Capt. Shephard and fought in the Battle at Brier Creek, SC. He served as lieutenant under Capt. Smith in the Battle of Kings Mountain, taking command of the company after Capt. Smith's death. He commanded as captain under Cols. Campbell and Cleveland; served as captain in the battle of Cowpens. This service was verified by testimony by John H. Hail, 78 years of age in 1840 who knew personally of Samuel Hampton's service in the Revolution. Copy furnished in DAR Membership Applications # 71051, #527719.” He married Bethenia Bostick on 19 Aug 1785, the daughter of Col. Absalom Bostick and Bethenia Perkins, in Surry County, NC. Bethenia was born 18 Mar 1767, prob. in Pittsyvlania County, VA and died 1832. 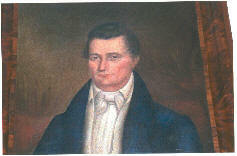 Samuel Hampton died 19 Dec 1802 in Stokes County, NC. Manoah Bostick Hampton was born 25 June 1799 in Stokes County, NC. He married Cynthia Mitchell (24 Jun 1795-21 May 1853) on 28 February 1822 in Stokes County, daughter of Andrew Mitchell and Sarah “Sally” Snoddy. Manoah and Cynthia followed in the footsteps of many of our Scots/Irish families. They moved from the Carolinas into lower Tennessee and North Alabama, together or following each other. It surely had to do with the Indians being removed. In 1830, Congress passed the Indian Removal Act. During this time, the US government constructed forts all through North Alabama and Southern TN, and there is a Hampton Fort in north AL. In 1835, the Indians agreed to move beyond the Mississippi River. By 1840, all of the Eastern tribes had been subdued... as in the "Trial of Tears." By 1835 Manoah and Cynthia are in Huntsville, AL, where he acquires at least 200 acres of land and was a farmer. Manoah died 16 February 1858, and Cynthia died 21 May 1853. Born in Iredell County, N.C.
Born in Stokes County, N.C.
Mary Hampton (1823-1899) married Thomas Franklin Houston (b 30 Jul 1818 Hunting Creek, Iredell County, NC- died ?) the son of Capt. Placebo Houston and Elizabeth Ragsdale Young. Thomas Houston was a witness at the marriage of Walter Flavis McClure (1856-1915) and Mary Elizabeth "Lilie" Hampton (1863-1925). 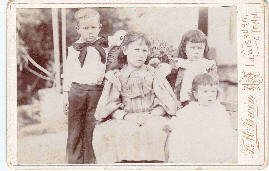 Lilie (her nickname) was the daughter of Manoah Bostick Hampton II and Emma Jane Battle, a niece of Thomas Houston's wife, Mary Hampton. Lilie & Walter married August 11, 1885, in Houstonia, Missouri, even though they lived in south Tennessee or north Alabama during their lifetimes. They were my great-grandparents, and are buried here in Birmingham, AL. The Houston’s were obviously friends or relations of many of our ancestors, including the Wright's, Dalton's, and Mitchell's. 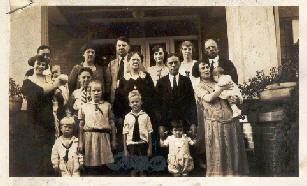 Nancy Young was one of our ancestors. As were Cynthia Mitchell; and Daniel Wright. “He laid out the town of Houstonia. His early youth was spent in acquiring an education, and assisting his father in the duties of the plantation. When about twenty years of age he began the study of law under the tuition of Gen. James Cook, of Mocksville, and afterwards with Hon. R.M. Pearson, late Chief Justice of the Supreme Court of North Carolina, and was licensed to practice by the Supreme Court of the State in June, 1840. In 1845, he located in Leighton, Ala., where he was married that year to Miss Mary M. Hampton, a lady of culture and refinement. She is a native of North Carolina, but was raised in Alabama. In the autumn of 1848, he came west, locating where now stands the village of Bunceton, Cooper County, Mo. Here he continued farming until the spring of 1851, when he came to Pettis County, locating on his present farm. His original purchase was 920 acres, to which he subsequently added until he was in possession of a body of near 5,000 acres. Since his coming to this county Colonel H., has changed the appearance of this locality to a great extent, and in a few years the fruits of his industry were plainly visible. Broad fields of wheat and corn, to the extent of 3,000 acres, large herds of cattle, sheep and swine, could be seen where but a few years previous was barrenness and waste. His improvements were of a substantial as well as an extensive character. At the breaking out of the war, Col. Houston was a strong Union man, but on account of the policy adopted by the Federals, he became an earnest sympathizer with the Southern cause, and early in 1861, joined the Confederate corps under Capt. Robinson. Early in 1862, he was commissioned Lieut.- Colonel, to organize and drill a regiment, which he succeeded in doing, and was captured by the Federals when about ready to depart for the front. He was kept a prisoner, and was indicted by the United States Court, and kept under parole until 1865. When he returned home he again took up the peaceful pursuits of his business. That he has been identified with the development of the county, as well as the organization of society, are facts too widely known to admit of question. He was one of the founders of the Agricultural Society, and was chosen president and director, which offices he filled efficiently for many years. He, in fact, gave liberally of his time and means to its support. He organized and established the first school in this section, and has been an active worker for educational interests since. He was also one of the founders of the Houstonia Christian Church, and has been a liberal contributor since its organization. During the agitation of the railroad project the Colonel was elected a director of the Lexington & St. Louis R.R. Company. He was then elected vice-president, and later, president; which office he held until the road was transferred to the Missouri Pacific Railway Company. In the autumn of 1880, he was unanimously chosen by the Democratic Convention as a candidate for Representative to the Legislature, and was elected by a large majority, although he persistently refused the office. He has made an efficient and honorable Representative, and identified himself with measures which resulted to the advantage of his constituents. He has raised a family of five children: Frank, an attorney of Sedalia; Augustus Y., also a business man of Sedalia; Mary, wife of Jas. 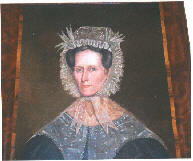 S. Napton; Elizabeth, who died in 1875, wife of John Napton; and Emma who resides with her parents.